The arrondissement, called Opéra, is located on the right bank of the River Seine. It contains many places of cultural, historical, and architectural interest, including the Palais Garnier, home to the Paris Opera, Boulevard Haussmann, and its large department stores Galeries Lafayette and Printemps. The arrondissement has many theaters including Folies Bergères, Théatre Mogador and Théatre de Paris. Along with the 2nd and 8th arrondissements, it hosts one of the business centers of Paris, located around the Opéra. The land area of this arrondissement is 2.179 km2 (0.841 sq. miles, or 538 acres). Wikimedia France has its offices in the arrondissement. 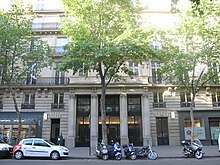 Groupe Danone has its head office in the 17 Boulevard Haussmann building in the 9th arrondissement. Danone moved there in 2002. BNP Paribas has its head office in the arrondissement. Crédit Industriel et Commercial. Kroll Inc. also has an office in this arrondissement. Gameloft has its registered office and head office in the 9th arrondissement. It is on the fifth floor of 14 rue Auber. Until June 1995, the head office of Société Générale was in this arrondissement. On that month the head office moved to the Société Générale Towers. The former head office remains as the company's registered office. Google Paris has its offices in the arrondissement. The peak population of the 9th arrondissement occurred in 1901, when it had 124,011 inhabitants. Since then, the arrondissement has widely attracted business activity. As a result, the population was in 1999 only 55,838 inhabitants, while it held 111,939 jobs. ^ "Paris ninth arrondissement". Paris Digest. 2018. Retrieved 2018-11-20. ^ "Nous contacter". Wikimedia France. Retrieved on 8 May 2010. ^ "Contacts Archived 2013-11-03 at the Wayback Machine". Groupe Danone. Retrieved on 23 March 2010. ^ "Danone : regrouper les salariés dans un même bâtiment". Le Journal du Net. Retrieved on 26 July 2010. ^ "Legal Information". BNP Paribas. Retrieved on 25 October 2011. "Registered Office : 16, Bd des Italiens - 75009 Paris (France)"
^ "Office Locations". Kroll Inc. Retrieved on 14 August 2011. "Paris Place de l’Opéra 6 rue Halévy 75009 Paris France"
^ "Personal data." Gameloft. Retrieved on 8 March 2019. "The Gameloft Human Resources team and staff providing support for the recruitment process locally at Gameloft entities in Europe or at the headquarters based at 14 rue Auber 75009 Paris, France "
^ "Legal notices." Gameloft. Retrieved on 8 March 2019. "Registered office: 14 rue Auber, 75009 Paris, France"
^ "World presence." Gameloft. Retrieved on 8 March 2019. Hover mouse over Paris to see: "France - Paris 14 Rue Auber, 5th floor, 75009 Paris"
^ "Société Générale : deux tours à la Défense". Le Journal du Net. Retrieved on 7 July 2010. ^ "Legal information". Société Générale. Retrieved on 24 September 2009. ^ "Google locations." Google. Retrieved on May 25, 2016. "8 Rue de Londres 75009 Paris France"
This page was last edited on 7 March 2019, at 18:36 (UTC).